Russian futurism was a literary as much as an artistic movement, and its relentless creative experimentation thrived on the exchange of ideas between different artists and different disciplines. In July 1913 Malevich collaborated with the musician Mikhail Matyushin and the poet Aleksei Kruchenykh on a manifesto calling for the dissolution of language and the rejection of rational thought. Kruchenykh coined the word zaum – meaning ‘beyond reason’ – to describe a new language of sounds without meaning. Joined by the poet Velimir Khlebnikov, the three men staged a futurist opera, Victory over the Sun, in St Petersburg in December 1913. The opera depicts the Strongmen of the Future who capture the sun, ushering in a new era in which time itself has been abolished Kruchenykh contributed a frequently unintelligible libretto that was accompanied by Matyushin’s discordant score, while Malevich designed the outlandish costumes and backdrops, dominated by geometric areas of colour. He also orchestrated the lighting, which transformed the performers into an ever-shifting series of dynamic sculptural forms. The group’s innovative treatment of language proved fundamental to Malevich’s thinking. The idea of words without meaning encouraged him to abandon pictorial conventions to conceive what he called alogical painting. Cow and Violin 1913 with its disparate sense of scale is a prime example. Alogical painting allowed colours and forms to sever their ties to the physical world; this would prove crucial for Malevich’s move into abstraction soon after. A similar degree of radical innovation can be found in the collages of Olga Rozanova, a pioneering woman artist, who married Kruchenykh in 1916 and died tragically of diphtheria in 1918, aged 32. At a Knave of Diamonds debate in February 1914, wearing a wooden spoon in his buttonhole, Malevich declared his renunciation of reason. 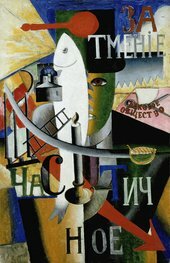 The wooden spoon also appeared in the painting An Englishman in Moscow 1914, which resembles an absurdist collage of unrelated objects at different scales – such as the white fish that dwarfs a medieval church – alongside fragments of text. The picture suggests the elements of a complex riddle without a solution. In August 1914, Germany declared war on Russia. The beginning of the First World War was greeted with an initial burst of patriotism, and the German-sounding St Petersburg was renamed Petrograd. Within weeks, however, Russian forces were outmanoeuvred at the Battles of Tannenberg and the Masurian Lakes, with disastrous results. It soon became clear that Russia was fatally unprepared for a long, drawn-out conflict. One of Malevich’s sketches from 1914 is the plan for a painting called War, apparently responding to the outbreak of hostilities. However, very shortly after working on the painting (even before a layer of dust had time to settle) he reused the canvas for a completely different work that shows how rapidly he switched to abstraction – a black rectangle entitled Black Quadrilateral.